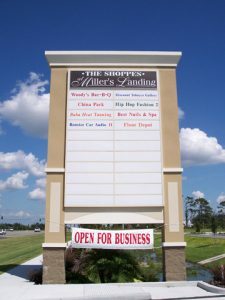 Saber Sign Solutions specializes in the designing, building, installation, maintenance, and even repair or tenant signs. Having catered to the business needs of numerous establishments, we have the knowledge, experience, and equipment to produce custom-crafted tenant signs that are a perfect match to your brand and budget. Tenant signs are extremely useful and practical, and many sign companies focus only on their function. At Saber Sign Solutions, however, we firmly believe that tenant signs can be as aesthetic as they are utilitarian. We don’t settle with just giving you a tenant sign that does the job, we give you a tenant sign that does the job beautifully. Saber Sign Solutions produces professionally crafted and tastefully designed tenant signs. The signs and even their changeable sign letters/numbers are custom-made according to your business’s personality, location, and target market. Saber Sign Solutions sources only premium materials, so we are confident of the quality of our signs and that their beauty can last a long time. 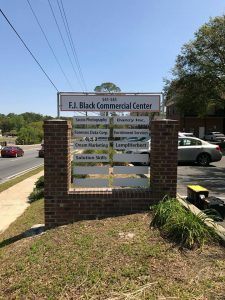 Whether you need elegant sandblasted signs, timeless wooden signs, sturdy monument signs, modern dimensional letters, or other captivating sign options, you can be sure that Saber Sign Solutions has the perfect one for your brand. 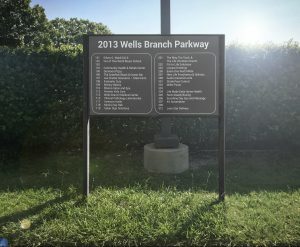 We at Saber Sign Solutions believe that a single sign speaks so much about the quality of a business. When you want your business to exude a sense of strength, permanence, and stability, your signs must embody that. This is why we at Saber Sign Solutions invest a lot in the quality of our materials because we believe each client deserves strong and durable signs. Tenant signs are exposed to outdoor elements 24/7 and it’s important that they are built durable enough to withstand them. Having been in the sign-making industry for many years, Saber Sign Solutions also has access to a vast network of sign material suppliers. We know where to source the best kind and for the best prices. So whether you need a single tenant sign or a multi-tenant sign, you can choose from aluminum, metal, acrylic, MDO plywood, etc. and we’ll make you a tenant sign specially built for long-term outdoor use. At Saber Sign Solutions, your options include fluorescent signs, high intensity displays, LED signs, LCD signs, projection signs, incandescent signs, and many more. With digital signage added to your tenant signs, you can engage your market highly customizable content that can even include photos and videos. They also serve as impressive 24/7 advertising tools for your business. And since Saber Sign Solutions is a full-service sign company, you can trust that we’ll be there to assist you every step of the way. From designing all the way to maintenance and repairs. Saber Sign Solutions is your all-around sign shop. 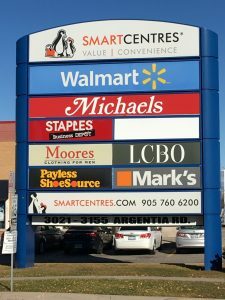 We don’t just print signs and banners for you, our strong team of local signage experts have been specially trained build, install, maintain, and even repair the most reliable tenant signs in the area. Don’t have a design for your signage yet? Not a problem! Saber Sign Solutions has a dedicated team of graphic artists and marketing specialists who can help you out with that. They can look into what your business is about, what your brand identity is, and what sign designs are a perfect fit. Saber Sign Solutions is also equipped with the knowledge and experience to produce tenant signs that comply with your local area’s regulations and guidelines for tenant sign placement and installation. Are you looking for a sign provider that builds dynamic, inventive, and long-lasting tenant signs? Saber Sign Solutions is here for you. 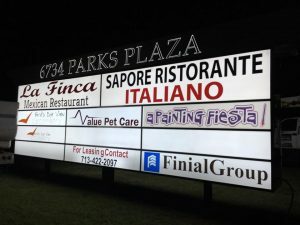 Our many years in the sign-making business have taught us how something as seemingly ordinary as a tenant sign can make or break your business. And, over the years, we’ve learned how to master the art of creating signs that meet the highly specific needs of our clients. Call Saber Sign Solutions today at (512) 861-2699 for your Free Consultation with a Tenant Signs Expert!